In the mid-1960s, Hobie Alter had a vision for a lightweight, inexpensive toy to play with when the wind ruined the waves for surfing. Using the techniques he pioneered in the surfboard industry, he conceived the Hobie 14 – the first true beach catamaran. It wasn’t too long before there were thousands of Hobie Cats, and the World Hobie Class Association was formed to help control the chaos. Rules were drafted to maintain the one-design aspect of the boats, which makes competition a test of sailing skill and not the thickness of one’s wallet. “The Hobie Way of Life” summarises how Hobie sailors and their families feel about a sailboat that gives them an irresistible sense of freedom, camaraderie, excitement and fun. The Hobie Cat family means friendships locally and internationally wherever Hobie sailors meet on the water, beach or over a rum, it puts you with people who have the same fun-loving interests. For some sailors, Hobie racing is about competition and the exhilaration of winning (or losing) fairly. For others, it’s the challenge, excitement, concentration and physical exertion. But for the vast majority of Hobie sailors, it’s about fun, camaraderie, familiar places, new places, old friends and new, and memories of fun times with people who share a love of the sport of sailing. 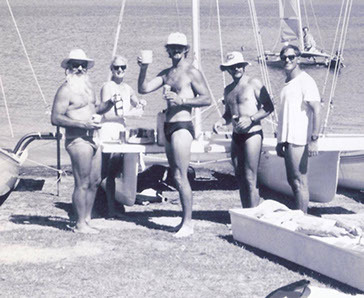 The Hobie Class of Victoria, as a regional association of the Australian National Hobie Class Association (ANHCA) carries on the “Hobie Way of Life” tradition that Hobie Alter started over 50 years ago. We organise a regatta calendar (including women’s and youth events) and can provide basic H14 and H16 race training and tuning sessions, provide grants to deserving youth sailors and a host of other services. If you own a Hobie Cat, we encourage you to support the class association by becoming a member. Membership is as little as $35 per year, or free (for one person per boat) if you come and join us at our State Titles weekend! Welcome to the Hobie Way of Life! We wish you fair winds and many happy days of great sailing.